Myanmar on Monday announced a sweeping amnesty for prisoners who were charged under draconian laws used to imprison activists, after the reformist president vowed to free all political inmates by the end of the year. The move is the latest in a series of prisoner releases since the long-isolated nation embarked on dramatic reforms as it emerged from junta rule nearly three years ago. It was not immediately clear how many people would be freed, but the presidential statement read out on state media indicated all prisoners detained or on trial under the country’s most controversial laws would be freed. “All prisoners who have been sentenced (under the following laws) are pardoned,” said the announcement. 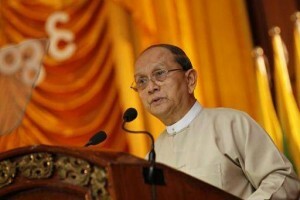 Former general Thein Sein, who has won international plaudits and the removal of most western sanctions for overseeing new political and civil freedoms, had vowed to free all detained activists by the end of the year. AFP was unable to reach officials late Monday to confirm the number of people potentially affected, but campaigners said it could have a broad impact. “This is quite a sweeping order, assuming it all comes true. There hasn’t been a high-level political act like this in more than 25 years,” David Mathieson, a researcher with New York-based Human Rights Watch, told AFP. Campaigners recently estimated there were around 40 political prisoners still behind bars. But more than 200 people are also thought to be facing trial on new charges under the quasi-civilian government, mainly for protesting without permission. Mathieson said these people were “basically peaceful political activists”, many of whom appeared to have been targeted by over-zealous local officials arresting campaigners who are trying to “push the boundaries” of unfair laws. The latest release is expected to begin Tuesday. The quasi-civilian government which took power in March 2011 has passed legislation allowing authorised peaceful protests, but demonstrators are required to seek permission in advance. Arbitrary imprisonment was a hallmark of nearly half a century of harsh rule by a junta that denied the existence of political prisoners, even as it imposed harsh punishments on rights activists, journalists, lawyers and performers. Before Myanmar’s reforms, rights groups accused the country of wrongfully imprisoning about 2,000 political detainees – most of whom have since been freed. The latest amnesty includes the most notorious old laws used by the former junta against its critics, including democracy campaigner Aung San Suu Kyi – who is now an opposition MP following the country’s dramatic reforms. It appears to also cover those currently facing charges but does not extend to people arrested after December 31. Mathieson called on the government to scrap the laws that penalise activists.